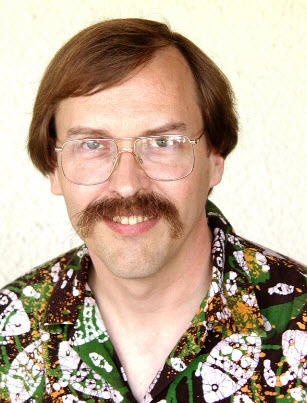 Larry Wall is the creator of Perl the programming language. This language is used for high level and multi-purpose tasks, incorporating a number of different programs within its base. It incorporates a number of different families within its structure, such as Perl 5 and 6. Wall’s original intention in creating Perl was as a reporting language that would make report processing that much easier and faster. Larry Wall was born in 1954. He grew up predominantly in Los Angeles before moving to Washington. His higher education began when he attended Seattle Pacific University in 1976, where he majored in chemistry. Later he also studied music and pre-medicine, after which he dropped everything for a long spell to spend time working on the computer system at the University. He finally graduated with a bachelor’s in Natural and Artificial Languages, putting him in good stead to become a programmer. It was during his time at graduate school at the University of Berkeley that Wall began studying linguistics, alongside his wife. The intention was to find a language, potentially an African one, for which no writing system existed, and to create such a system for it. The pair then intended to use this new system in order to translate different texts into this language, including such texts as the Bible. However, health issues surfaced and all the plans for this had to be cancelled. Instead of heading to Africa, Wall ended up joining the NASA Jet Propulsion Laboratory, where he finally finished his graduate studies. Wall has been the author of various programs, including the rn Usenet client, and also the very popular patch tool. He has won many accolades for this work, including the International Obfuscated C Code Contest on two separate occasions, and was also the person to win the first award Free Software Foundation Award for the Advancement of Free Software. He developed the Perl language later on when he was working for System Development Corporation, later to become a segment of Unisys. In addition to this, he co-authored the book Programming Perl, considered to be an excellent source of information for any programmer. Since then he has continued to write books on the subject, with his training in linguistics standing him in good stead in this area. Known for his good sense of humour and wry wit, Wall makes himself easily understood throughout his work, offering excellent interviews and lectures as a result. He compares Perl to that of a natural language and bases a lot of its creation on the designs coming out of basic linguistics. A strong Christian, much of his work is influenced by this, including the names of parts of the program, and even categories within documents being labelled, such as ‘apocalypse’ and ‘exegesis’. At this time, Wall is still very active and continues to oversee all the work on Perl and has final and absolute say in what changes are made to the official documentation.